This is part of a very unusual wall decoration. 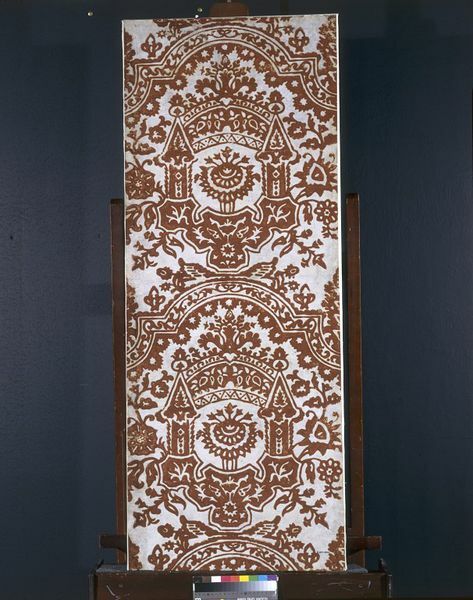 Embossed leather was a fashionable wall covering at this date, but the flock wallpaper is the earliest example to be found in this country. There is no other known example of panels of leather and flock hung in alternating panels in this way. Flock wallpaper was invented to imitate cut velvet, which was a more expensive wall covering. It was made by printing a pattern on paper using an adhesive instead of pigment, and then scattering powdered wool across the surface. This adhered to the glue giving a raised surface with a texture similar to velvet. The usual method for embossing leather was with a heated engraved metal plate, but there was an alternative process which involved wetting the leather and then pressing it into a wooden mould. The raised patterned surface was then embellished with gold and silver foils or varnishes, and other colours. We do not know the purpose of the room in which this wall hanging was found. 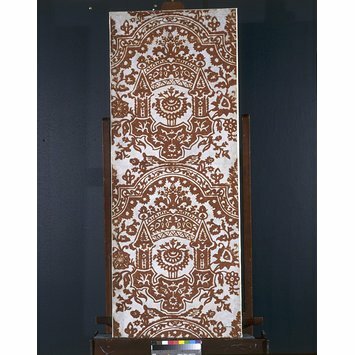 However, at this date leather wall coverings were often used in the dining rooms of the wealthy and well-to-do. Leather had an advantage over textile wall coverings because it did not retain the smell of the food. The pattern of putti supporting garlands of fruit and flowers was an appropriate decoration for a room intended for entertaining and for dining. 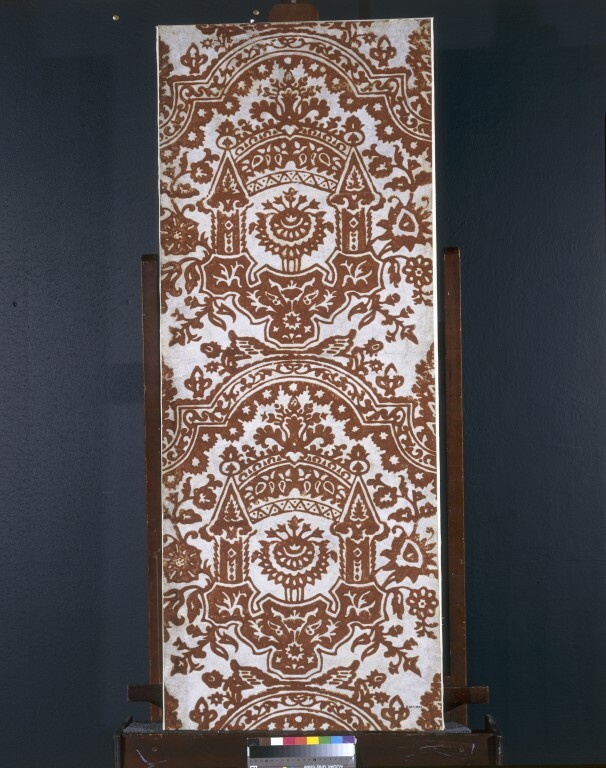 Panel of crimson flock wallpaper with architectural and floral motifs on a white micared background, alternating with a panel of leather embossed with a design of cherubs, garlands and fruits, and painted gold-bronze and white; Flock on paper and embossed leather, decorated with gold-varnished silver foil and paint. Given by the Very Reverend W. Moore Ede, Dean of Worcester. Provenance: Ivy House (built in 1679), Worcester Cathedral precincts,Worcester. Made in The Netherlands and/or England. The object came in together with E338-1932 and E339-1932: fragments of a later paper (ca. 1845) laid over the above. The whole room from which these panels were taken was decorated in this way with the two alternating patterns. The house was built in 1679 on the site of the old Charnel House (see Valentine Green, History and Antiquities of the City of Worcester (1796), vol I, p 56), and these wall decorations may be ascribed to about the same date, since they were found applied directly to the unplastered bricks and are discoloured with brick dust at the back. They had been subsequently buried under a canvas lining and many layers of later papers. After these had been stripped, the flock and leather were found intact, as originally arranged, in alternate patterns, with the flock paper always overlapping the leather. The flock paper is the earliest known in this country, the only other example of the same paper being at the Manor House, Saltfleet, Lincolnshire (E.2203-1925 neg 57211; see SE, pl 25, where it is wrongly dated to 1560-1600). Fragments of a very similar pattern are at Gwernhaylod (see Entwisle, ‘Early Wallpapers’, Country Life (1953), vol 114, 213, fig 3). The whole of the leather, embossed pattern as well as ground, was at one time laid with extremely thin silver foil. Over this are traces of a gold-bronze varnish, and over this in turn there is a coat of white paint, confined to the ground only. A portion of the leather was cleaned under the direction of Dr Scott of the British Museum laboratory with a solution of methylated spirit and pyridine, in order to expose some of the original silver ground. J. W. Waterer in Spanish Leather (1971), p 62, pl 41, states that there is an affinity with Dutch leather patterns, but thinks that the pattern is probably a simplified English version; he dates it circa 1690 (?). J. Sturt’s engraved trademark for Abraham Price’s warehouse (circa 1710-20) shows his interpretation of the flock pattern, or one very similar. See Entwisle, The Blew Paper Warehouse in Aldermanbury, London’, Connoisseur, May 1950, 94; Country Life (1932), vol 72, 80; Connoisseur, October 1932, 274; Greysmith, pl 25.